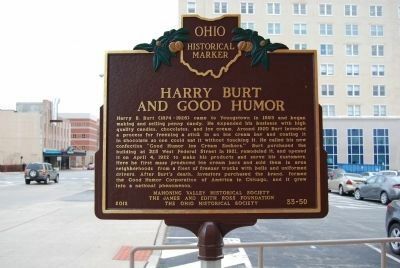 Harry Burt and Good Humor Harry B. Burt (1874-1926) came to Youngstown in 1893 and began making and selling penny candy. He expanded his business with high quality candies, chocolates, and ice cream. Around 1920 Burt invented a process for freezing a stick in an ice cream bar and coating it in chocolate so one could eat it without touching it. He called his new confection “Good Humor Ice Cream Suckers.” Burt purchased the building at 325 West Federal Street in 1921, remodeled it, and opened it on April 4, 1922 to make his products and serve his customers. Here he first mass produced ice cream bars and sold them in area neighborhoods from a fleet of freezer trucks with bells and uniformed drivers. After Burt’s death, investors purchased the brand, formed the Good Humor Corporation of America in Chicago, and it grew into a national phenomenon. of radios, televisions, and related components. 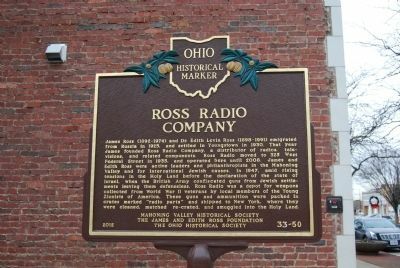 Ross Radio moved to 325 West Federal Street in 1935, and operated here until 2008. James and Edith Ross were active leaders and philanthropists in the Mahoning Valley and for international Jewish causes. In 1947, amid rising tensions in the Holy Land before the declaration of the state of Israel, when the British Army confiscated guns from Jewish settlements leaving them defenseless, Ross Radio was a depot for weapons collected from World War II veterans by local members of the Young Zionists of America. These guns and ammunition were packed in crates marked “radio parts” and shipped to New York, where they were cleaned, matched, re-crated, and smuggled into the Holy Land. Location. 41° 6.127′ N, 80° 39.269′ W. Marker is in Youngstown, Ohio, in Mahoning County. Marker can be reached from West Federal Street 0.1 miles west of South Chestnut Street. Touch for map. Marker is in this post office area: Youngstown OH 44503, United States of America. Touch for directions. Warner Brothers (about 400 feet away, measured in a direct line); Little Steel Strike (approx. 0.2 miles away); The First Log School (approx. 0.3 miles away); Central Tower / Mahoning National Bank Building (approx. 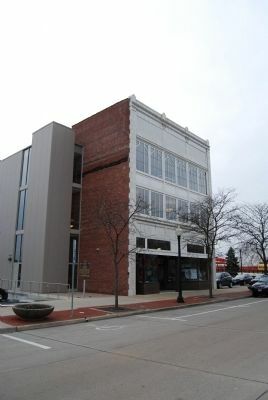 0.3 miles away); Union National Bank Building / Central Square (1798-1899) (approx. 0.3 miles away); 1959-1975 The Vietnam War (approx. 0.3 miles away); In Memory of the Heroes of the Township (approx. 0.3 miles away); Central Square (1900-2004) / Stambaugh Building (approx. 0.3 miles away). Touch for a list and map of all markers in Youngstown. More. Search the internet for Harry Burt and Good Humor / Ross Radio Company. Credits. This page was last revised on June 16, 2016. This page originally submitted on December 8, 2014, by Mike Wintermantel of Pittsburgh, Pennsylvania. This page has been viewed 345 times since then and 6 times this year. Photos: 1, 2, 3. submitted on December 8, 2014, by Mike Wintermantel of Pittsburgh, Pennsylvania.